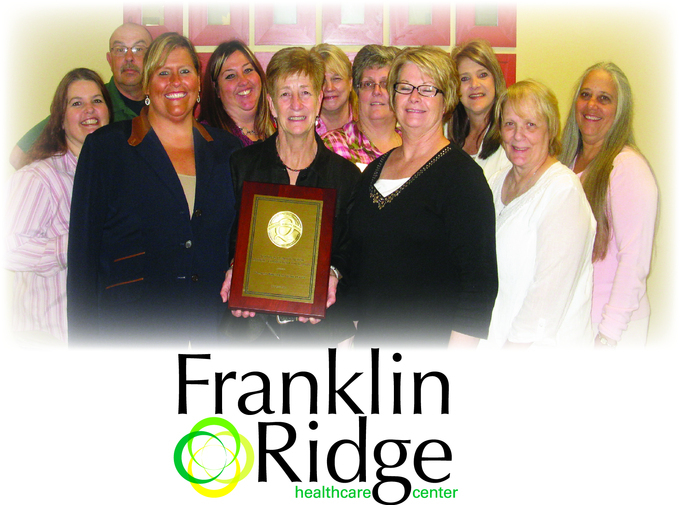 Franklin Ridge is acknowledged as a community leader in the provision of both short and long term care services. The combination of our skilled staff, personalized care, and physical, social and spiritual support create an ideal environment for maximizing one’s potential. Here are some of our notable awards and distinctions. Franklin Ridge is proud to be distinguished by the Ohio Department of Health as a “Deficiency Free” skilled nursing facility! This achievement is very difficult to receive and rarely awarded. The Ohio Department of Health conducts surveys of skilled nursing centers on average every twelve months. To earn this award, six state surveyors spent four days evaluating the performance of Franklin Ridge in complying with hundreds of both federal and state mandated standards. The standards measure areas of overall quality of care, environment, food and nutrition, activities, social services and physical environment. After this rigorous inspection, Franklin Ridge was determined to be in compliance with all standards. We are so proud of our staff for working each day to enhance the quality of life for those we serve and for earning this prestigious distinction. Franklin Ridge is a member of the Ohio Healthcare Association and was honored by the Franklin Chamber of Commerce for its investment in the community when completing its nearly one million dollar renovation. Additionally, Kim Sizemore, Director of Marketing and Admissions, was selected by the Ohio Health Care Association as its Hero of Long-Term Care for the month of February 2014. And Anita Buddo, Administrator of Franklin Ridge Healthcare, was named Administrator of the Year by the Ohio Health Care Association in 2015. Franklin Ridge was also recognized in 2014 by the American Health Care Association with a National Bronze Award for Quality. This award is in acknowledgment of the Franklin Ridge staff and administration’s ongoing commitment to improving the quality of care provided to all those we serve. The facility has proudly served the Franklin and the surrounding area for 40 years, evolving to meet the changing healthcare needs of these communities. Interested in learning more about the Franklin Ridge Community? Contact us today to schedule a tour.